We met with Philippe De Boysere, a colonel in France’s National Gendarmerie, and his colleagues in Kyiv to discuss an EU-funded Twinning project that aims at modernizing the Ukrainian Interior Troops. With its €1.55 million budget provided by the EU, the initiative aims to improve the system of Ukraine’s public order protection practiced by the Interior Troops of Ukraine’s Ministry of Internal Affairs. It also tries to bring Ukrainian practices closer to EU standards of protecting citizen rights and freedoms. “What we are trying to transfer to Ukrainians are the skills to maintain order in a soft way, with precise technical gestures, with techniques of dealing with the public,” says De Boysere. In addition to heading the project, he is also the head of international affairs of the Director General’s office of the National Gendarmerie of the French Interior Ministry. While in Kyiv, De Boysere, in collaboration with his colleagues, is transferring his experience to Ukrainians. About 100 public order specialists from the EU, particularly from France and Romania, have travelled to Ukraine as part of the Twinning project to transfer their skills to their Ukrainian colleagues. A total of 240 Ukrainian interior troops instructors have been trained (about 200 of them received certificates and are now qualified to train others) in new tactics for maintaining public order, including during mass events like Euro 2012 football games. “We trained them how to restrain a person without beating him or her, how to balance action and reaction, using armlock instead of a truncheon or a gun,” says Michel Gerber, the Resident Twinning Adviser of the project. In addition to training sessions, the EU experts provided advice for structural changes to the Ukrainian interior troops and proposed amendments to the related laws. Changes on the ground, “should be matched with statutes and guidelines that will change the whole training system of the interior troops on the legislative level,” says Kovaliov. Six study tours of Ukrainian top specialists to EU member states (including France, Germany, UK, Spain, Romania) will also contribute to this transformation. “When we change the thinking of the people who are directly responsible for the functioning of the whole system, changes will go faster and better,” Kovaliov adds. The project not only helps change the Ukrainian interior troops from within but also improves their communication with society. “A drawback of many of the law enforcement press teams in Ukraine is a lack of multi-year planning for communicating with society,” says Victoria Kushnir, head of the press service of the Main Department of interior troops. The project helped address this drawback, making the communications of Ukraine’s interior troops more open and better planned. 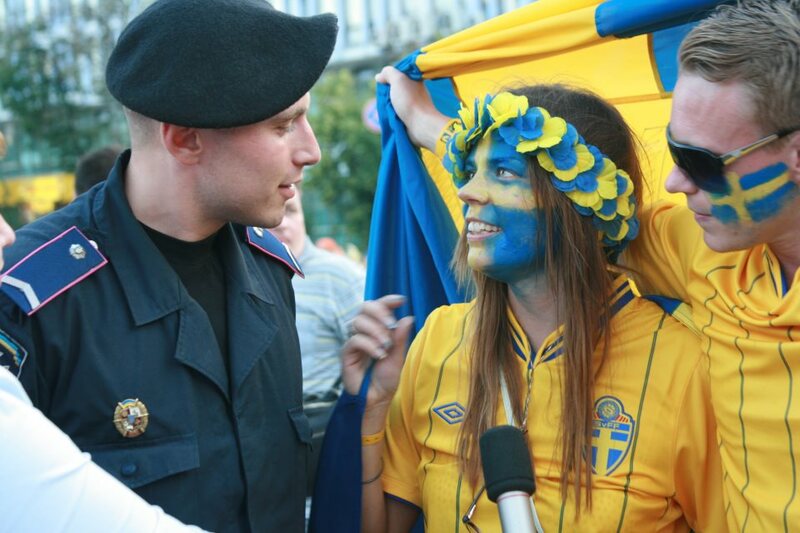 During the Euro 2012 football championship, the skills acquired through the Twinning project helped the interior troops’ press team provide the necessary information to domestic and foreign media. With this range of activities, the project helps Ukrainian law enforcement services become more efficient and also brings them closer to citizens. It contributes to bringing Ukrainian practices more in line with EU standards when “expression of freedom is better framed but less repressed,” concludes Michel Gerber. The EU Twinning project, ‘Contribution to improvement of the system of public order protection by the Interior Troops of the Ministry of Internal Affairs of Ukraine,’ is implemented through cooperation between the Ministries of Interior of France, Romania and Ukraine. The EU has contributed €1.55 million to implementing the initiative.